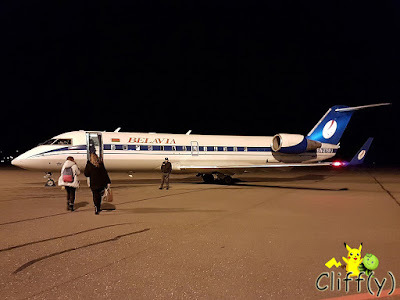 Have you flown with Belavia Belarusian Airlines before? I was certainly thankful for the opportunity to visit the country that's very closely linked to Russia, even though I haven't been to the latter. 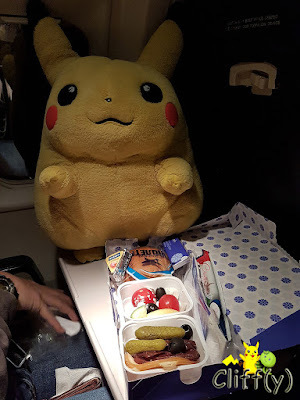 Today's post features two different meals on two separate flights. 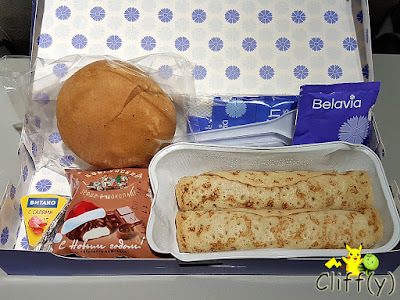 The first flight that my BFF and I took was from Batumi, Georgia to Minsk, Belarus with everyone receiving the same set of cold breakfast items. I started off with the salad comprising tomatoes, cucumbers, olives and feta cheese. The ingredients were of acceptable freshness, going well with the packet of sweet and tangy Italian dressing. Even though the beef slices weren't particularly tender, I enjoyed them as they were pretty tasty and cold enough for my liking. Accompanying the red meat were gouda cheese, gherkins and more olives. I didn't really like the bread as it was quite dry. I ate half of the bread with the cheese wedge provided at the side. The dark chocolate bar provided was truly enjoyable. At first, I had a cup of medium brew coffee to jolt my senses awake. 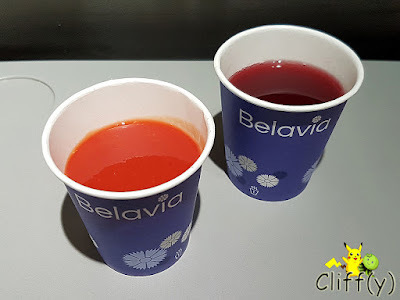 When a flight attendant made a second round of drinks, my BFF and I requested for tomato juice and cranberry juice respectively. The latter tasted pretty natural to me without too much sugar added. 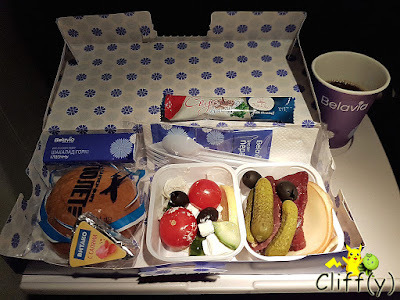 For the flight out of Minsk to Istanbul, Turkey, each of us got to choose between two hot main course items. I wasn't expecting that at all. I enjoyed the savoury chicken rolls for breakfast. The wraps were chewy and not-too-thick, encasing seasoned shredded chicken. 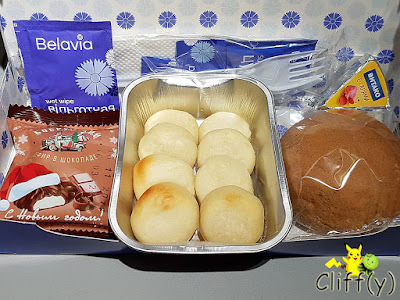 Interestingly, the moment I sank my teeth into one of them, I was reminded of the filling of lemper ayam, an Indonesian snack of stuffed glutinous rice. For something sweet, the cheese balls might be something for you. In my opinion, they were a tad too doughy, but they tasted pretty unique. Anyway, the sweetness level wasn't that high. The bread was slightly better as it wasn't too dry compared to the described earlier. The same cheese wedge was given, along with a packet of marshmallow dipped in chocolate that was way too sweet. I was pretty sad when I didn't see a chocolate bar inside the box. I only had a cup of tea that morning, which turned out to be quite strong. I added a bit of UHT cream to it. 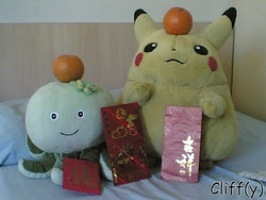 Pika's advice: Enjoy the cranberry juice if you like it. 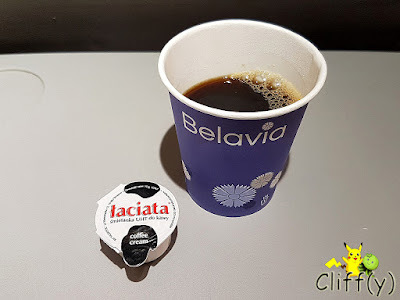 I'm sure the flight attendants are happy to pour you some more. Do look forward to posts on Belarusian cuisine coming up soon!